To create Cassie's Straw Painting you need to take the leftover bubble mixture from Bubble Printing and a straw and jump right in! The straw is your paintbrush. Here is Cassie painting. It is nice watery paint and some of it gets trapped in the straw so it makes it kind of like a drip painting too! To create the Painting that we blew the paint, we just spooned some of the same paint on some paper like this. You could add more or less as you go along. Next take the straw and blow the paint around. The paint should be liquid enough to do this. It also helps to turn the paper around as you go along. A little to tricky to blow around, but fun once you get the hang of it! 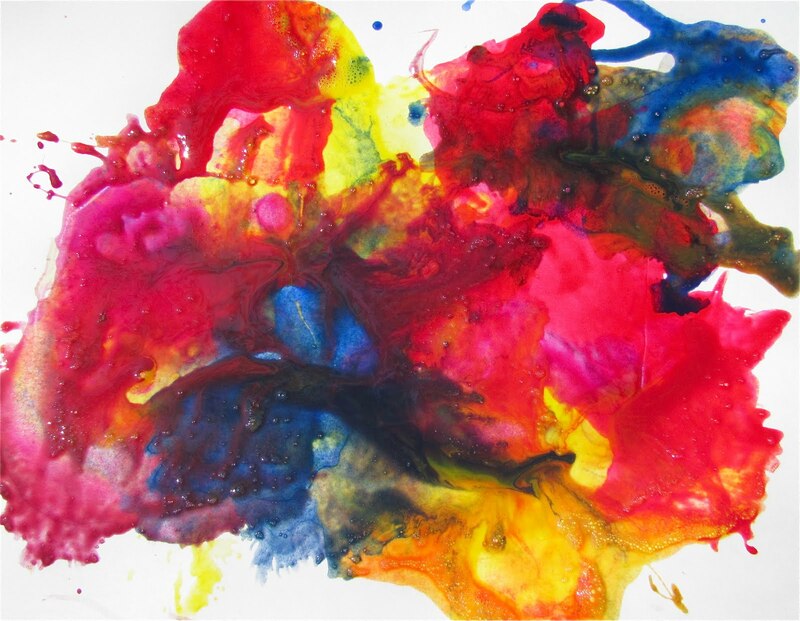 It was fun to see the colors mix together, especially since we had red, yellow, and blue paint (primary colors!) It was also neat to imagine things in the paintings!!!! DO YOU LET YOUR CHILDREN EXPERIMENT TO CREATE THEIR OWN IDEAS? I think she might of even enjoyed this more than Bubble Printing!!! Cassie's so creative! She's gonna be giving you ideas more and more before you know it! So fun! 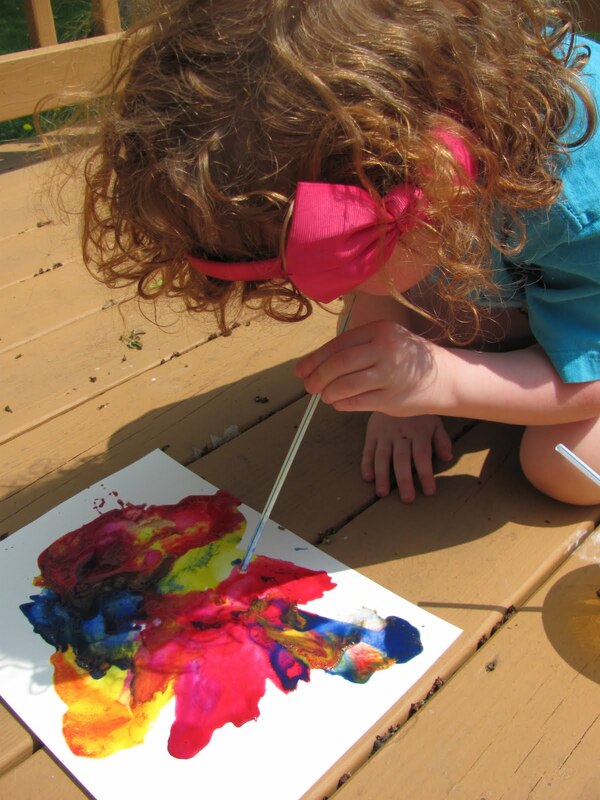 Love her innovative way to paint with!! And straw blow paint looks fantastic. Great to see the pleasure Cassie had in creating a way to paint! Such creativity. We've been reading a book about Elephants painting and I was trying to think of an activity to go with it. As I was reading this post and saw her with her straw, it hit me to try this and let the straw represent the elephant's trunk. I'll have to post about it next week- I'll link back to you and your creative gal! What do I think? FUN FUN FUN!!! next sunny day we will have a go outside. Love it! Thanks again for sharing over on Red Ted Art!! What a great idea! 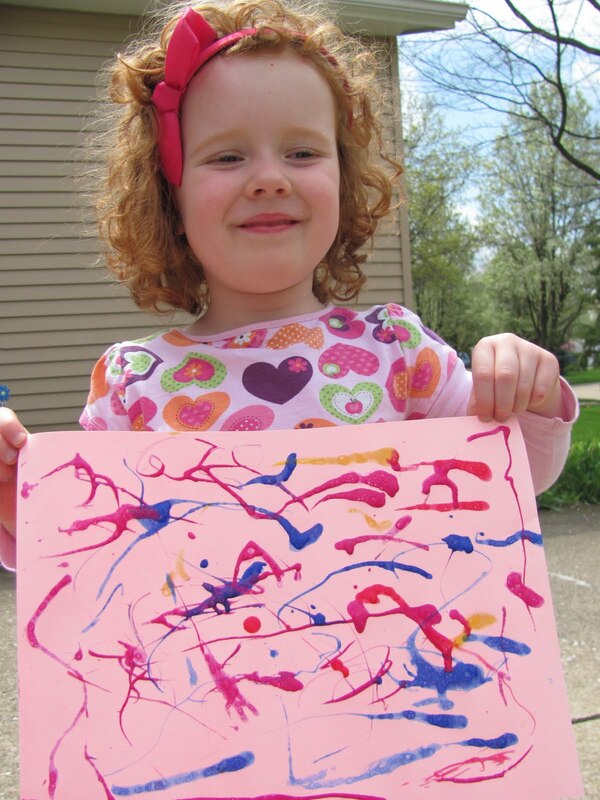 We love bubble painting here. We'll have to try the straw painting when we're finished next time. I remember doing this as a child and loving it. I can tell she liked it too! Thanks again for linking up. I'd love for you to link up over at Fun For Kids Friday! SO many great painting ideas in the outdoor link up this week. Thanks for sharing. 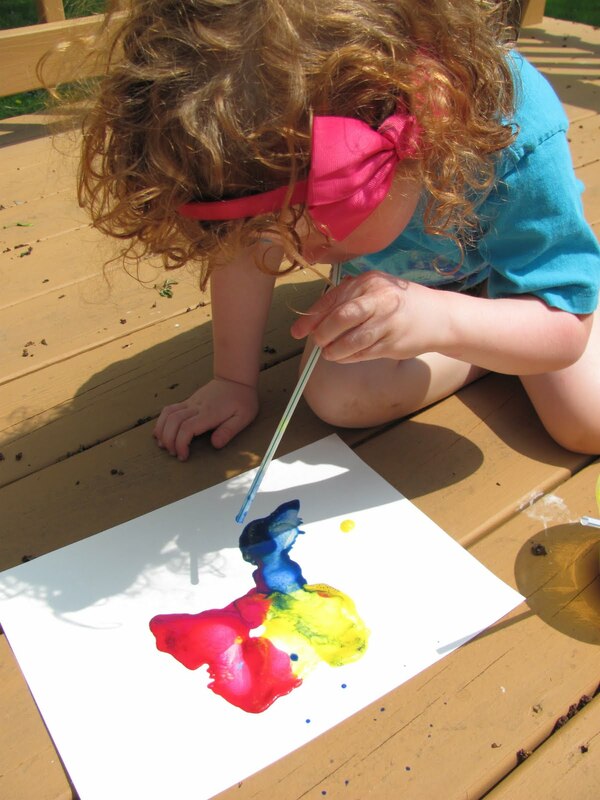 Love the idea of painting as an outdoor activity. I thought a grown up did it! I love it. To me it is dreamy and flowing and creates a calm emotion in me! Thanks so much for including this fun painting technique at my Summer Fun Party. I'm showcasing it in a Five Fun Ideas with Paint post. Hi I m a new blogger,liked ur blog very much.I liked this exploration of cassie very much,surely will try same with my four year daughter. Thanks for linking up over at the We LOVE Paint linky party over at PreKandK Sharing!!! Straws are a great tool for painting!